The teacher and his student sit facing each other in the dojo. They bow, signaling the beginning of the lesson. Bringing their shakuhachi to their lips, they warm up with what they call “long tones.” An eerie, haunting sound emanates from the Japanese bamboo flutes, transporting the listener to ancient Japan. But this isn’t Japan, and the musicians aren’t Japanese. This is the Brooklyn teaching studio of James Nyoraku Schlefer, one of only a few non-Japanese to receive the Dai-Shi-Han, the Grand Master certificate in shakuhachi. The student, Nora Nohraku Suggs, is a licensed shakuhachi player and Western flute instructor who drives two hours from Pennsylvania to take lessons from Schlefer. Both are dedicated to playing and promoting the instrument and music that arrived in Japan from China in the 6th century. What started out as meditative practice by Zen Buddhist monks (music called honkyoku) evolved into entertainment for the upper class in the 18th century, ensemble music known as sankyoku that was created for the shakuhachi as accompaniment to the koto and shamisen. Shinkyoku, or “new music,” was developed during the post-Meiji era and influenced by Western music. On this particular day, Schlefer instructed Suggs in sankyoku, as the two practiced three of the four seasonal pieces composed by Yoshizawa Kengyo (1808-1872). Seemingly everything in Japan revolves around the seasons, and music is no exception. Schlefer and Suggs played “Aki” (fall), “Natsu” (summer), and “Fuyu” (winter) during the lesson, reading intimidating sheet music that was spread out between them. Since teacher and student traditionally face each other during the lesson, Schlefer reads the notes upside-down. 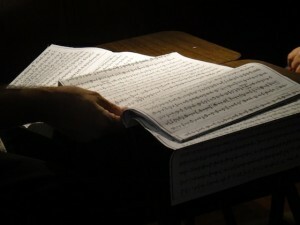 Reading complicated and daunting sheet music upside-down is only one facet of shakuhachi playing in which Schlefer gained proficiency over the course of thirty years. 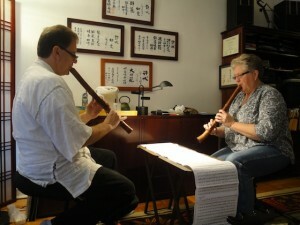 Schlefer was introduced to the shakuhachi as a grad student in 1979, when he attended an ensemble at a professor’s residence. Offered the chance to play the ancient bamboo flute after the concert, Schlefer, who has a Master’s degree in Western flute and musicology from Queens College, was unable to produce a sound. Taking that as a challenge, he found himself devoting his life to mastering the instrument. 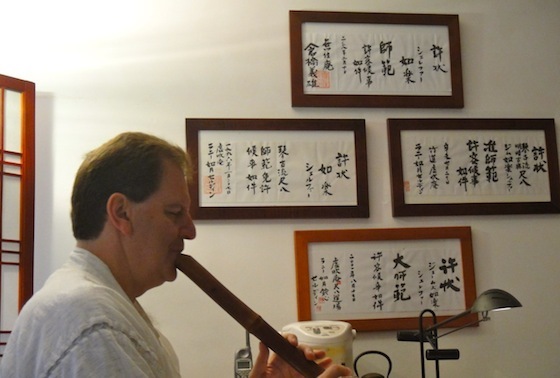 The complexity that drove Schlefer to learn the bamboo flute is also one of the reasons shakuhachi playing is not as crowd-pleasing in Japan as it once was. In this age of instant gratification, the instrument’s difficulty is a hard sell to young people who don’t have the requisite patience. Still, the sound is compelling enough to generate interest – in learning or simply listening – regardless of nationality. Schlefer acknowledges that being non-Japanese is actually beneficial to shakuhachi playing and teaching because Westerners are not held to the traditional standards as strictly as Japanese students. To that end, the instrument is gaining popularity worldwide. Shakuhachi music has been fashionable in Europe and Australia for quite some time, and in the last decade Schlefer says shakuhachi societies have formed in places such as the Middle East, Russia, and Brazil. Here in New York, Schlefer has been teaching for 18 years. In addition to giving private lessons to twelve people, he has five students in a brand new class that began in the fall semester at Columbia University, part of the school’s Institute for Medieval Japanese Studies. Schlefer also has a relationship with Tenri Cultural Institute’s musical arm, Arts at Tenri. Through his organization, Kyo-Shin-An, Schlefer coordinates concerts for the shakuhachi with Western music. At a recent concert at Tenri, Schlefer performed with Colorado Strings, an all-female quartet, playing pieces composed by Schlefer himself. Despite the licenses, awards, and accolades, Schlefer says that his almost two decades of teaching an ancient Japanese musical instrument have given him a chance to continue to grow. Words of wisdom from the master in his dojo. I’m from the Philippines and I was amazed with the fact that even a Japanese bamboo flute looks simple in appearance but it is actually very difficult to play. I’ve read that if plays by the master this Shakuhachi Flute create an amazing, subtle, sensual music – prized as being perfect for meditation and relaxation. It’s beautiful, soulful sound made that best hear when you are taking a good rest or about to sleep. Previous Previous post: Happy Holidays from JapanCulture•NYC!